This house is a landmark in Mayerthorpe, and many of my Mayerthorpe friends and family will recognize it. It is called Crockett House was built in 1935 by Leo Crockett Sr. 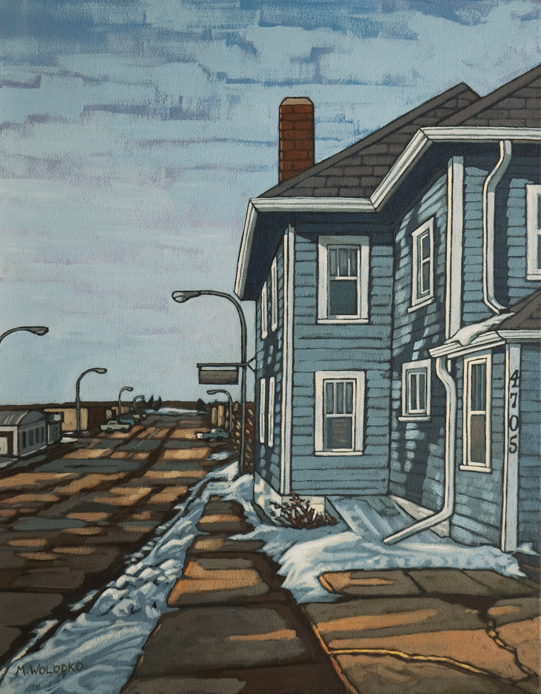 It sits prominently on Main Street at the top of the hill, just as you approach downtown. In this painting I was surprised by how much fun it was to paint the various colours of light and shadow that fell on the street. You can read a bit more about the house here. 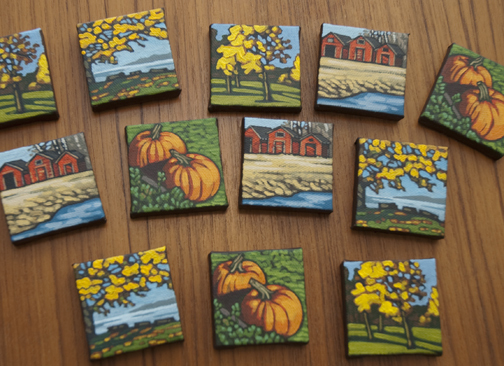 I recently was asked to do some little paintings to be used as client Christmas gifts for a design company. (Okay, so the design company is owned by my husband – I guess I should mention that). 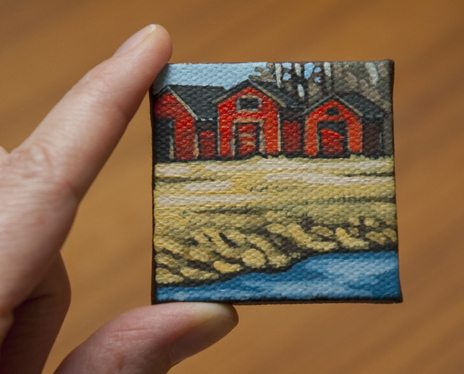 Anyway, I was so excited to try working on these tiny paintings and immediately saw the potential for holiday gift ideas. 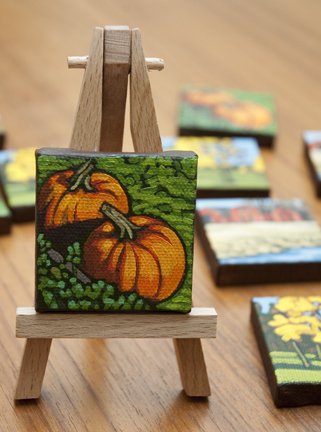 We found some cute 2” x 2” canvases at the art store that came with a mini display easel. I decided to do 3 or 4 at a time (of the same image) – an efficient use of time and paint. 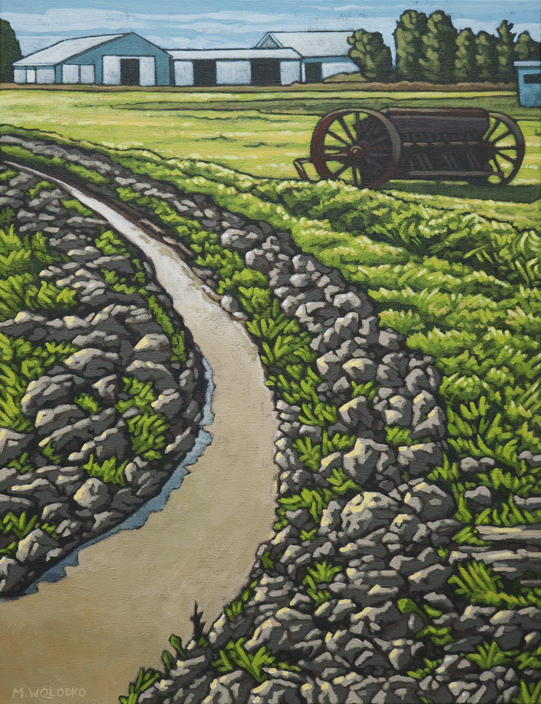 Although the images repeat, each painting is original and different. I have just started on my fifth set, and I think I am hooked! I love that in 2 hours, I can finish 3 paintings. It ‘s hard to find painting time these days. Preparations for Thanksgiving, birthday parties and Halloween have all eaten into my painting time. 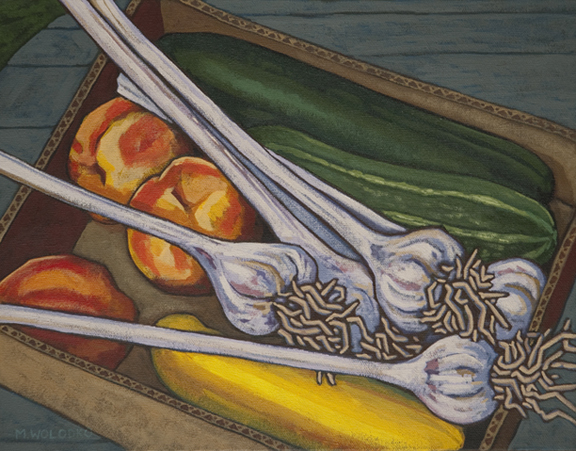 I have finally finished my little garlic study. It has turned out a little moodier than I had planned, but overall, I am happy with it. 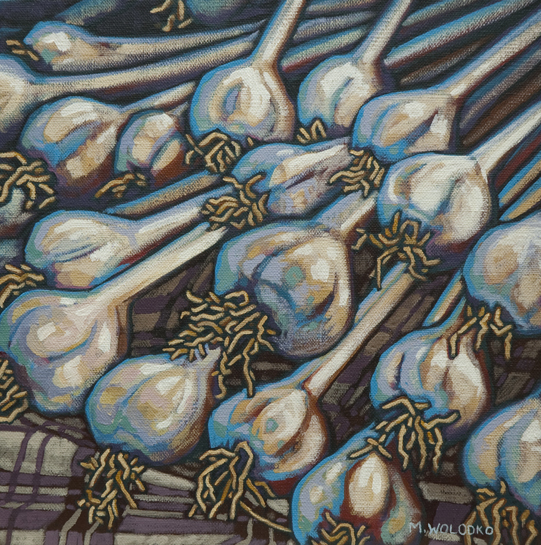 I did struggle a bit – trying to decide how much of the underlying colour to keep and how white to make the garlic. 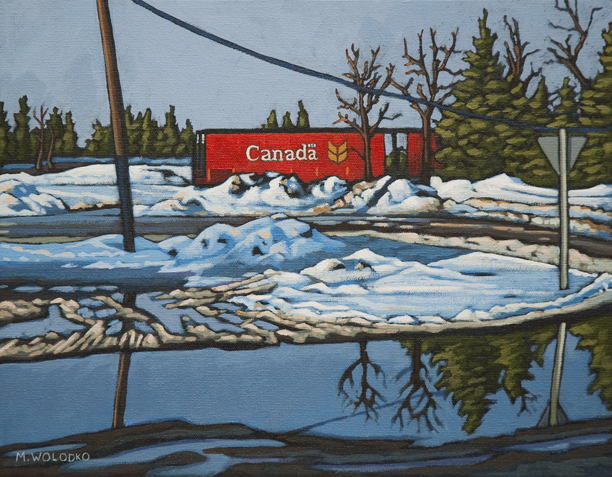 Surprisingly, the area I had the most fun painting is the small area of plaid cloth in the foreground. I might have to try more of that. Summer Produce 11" x 14"
As I write this post it is chilly and has been drizzling all afternoon. It is getting dark, and it’s only 6:15. 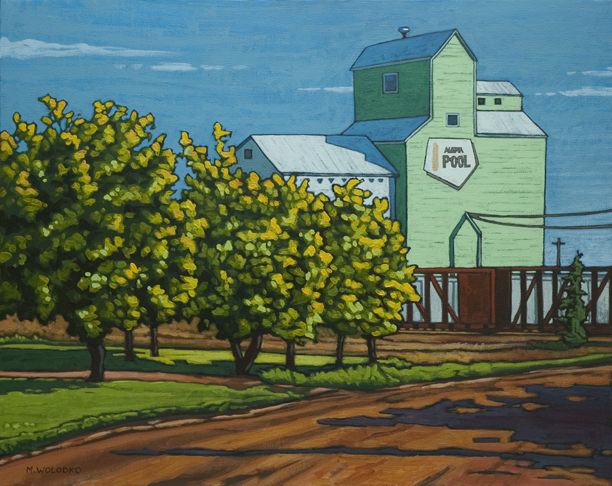 This painting takes me back to a hot August day when we drove to the farm. As you can see, we brought home a little bit of everything. The most exciting find on that day was the garlic – both for the taste and the look of it. It is so much fun to paint. At first glance, it is white. But if you look more closely, it has all kinds of beautiful undertones: purple, pink, blue and yellow. I am tempted to try another study of this garlic so I can play with the intensity of these colours. But on this cold, rainy night, I am happy to be having it on my pizza.